Brookhaven’s Goin’ to Town Car Show will be in Downtown Brookhaven on March 2nd along with our Third Annual Downtown Jazzed up Mardi Gras event. The car show will be held from 8am to 3pm. 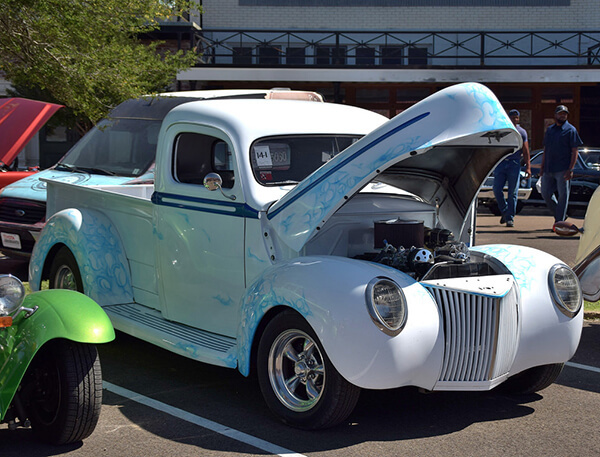 The show has become popular over the years, attracting car owners from all over the country. Last year’s selection of cars came from Mississippi, Alabama, Florida, Louisiana, Tennessee and Arkansas. Over 150 cars will be set up along Railroad Avenue from the Inez south to Brookhaven Glass Co. on East Chickasaw Street and on both sides of Railroad Park. There will be dozens of awards in categories like Top 25, Sweet 16 and the Fielder’s Pro Shop Sponsorship plaque, Mayors’ Choice and Chambers Choice. Early registration is available for $10, or $15 on the day of show. To register, call 601-833-8620 or 601-833-1411. The Brookhaven Fire Department will be demonstrating their extrication skills and a Jaws of Life demonstration. Also, all of our local shops and restaurants will be open with specials and sidewalk sales. There will be bounce houses for the kids and so much more. You won’t want to miss this exciting day in downtown Brookhaven!